Winona Ryder has three movies about to come out and has finally spoken about her arrest for shoplifting at Saks Fifth Avenue in December of 2001. 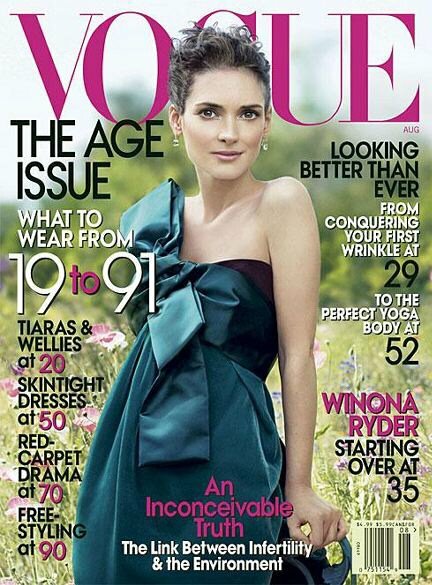 You can read all about it in the August 2007 issue of Vogue. "I didn't have this tremendous sense of guilt, because I hadn't hurt anyone," Ryder tells Vogue magazine for its August cover story. "Had I physically harmed someone or caused harm to a human being, I think it would have been an entirely different experience." Her personal reaction, she says, was "I never said a word. I didn't release a statement. I didn't do anything. I just waited for it to be over." Still, she says, "The attention was what was embarrassing." She also expresses dismay that one day the news of her arrest topped stories on the supposed capture of Osama bin Laden. Ryder ? who was convicted of grand theft ? explains that life had been bumpy for her just before the arrest. "Two months prior to that, I broke my arm in two places, and the doctor, a sort of quack doctor, was giving me a lot of stuff and I was taking it at first to get through the pain. And then there was this weird point when you don't know if you are in pain but you're taking it." She said painkillers of the type she was on ? such as Oxycodone, which should not be confused with OxyContin ? left her in a state of "confusion," but that her arrest "in a very weird way, was a blessing, because I couldn't do that [painkillers] anymore." Once her court issues were resolved, Ryder moved to San Francisco to live near her parents (she also has a house in West L.A.), and made "a very conscious decision not to work," she says.